Watchable, nicely animated fairytale with a commendable message about racial and religious tolerance but the script is perfunctory at best and the quest itself is disappointing. A European co-production, The Princes' Quest is directed by Michel Ocelot, using 2-D animation that's essentially a digital upgrade of the black paper cut-out silhouette technique. 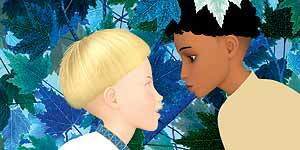 It tells the story of two boys raised by the same woman: Azur (Leopold Benedict), the blond, blue-eyed son of a nobleman (Keith Wickham) and Asmar (Frederick Benedict), the dark-skinned, dark-eyed child of the nurse (Suzanna Nour). The children grow up hearing a fairytale about a heroic prince rescuing a Djinn fairy, both believing that the quest is their destiny. After being cruelly separated by Azur's father, they reunite years later as grown men (now voiced by Steven Kyman and Nigel Pilkington), both determined to embark on the quest. There's a commendable message about racial and religious tolerance here, but that message is slightly undermined by the fact that none of the Arabic dialogue (of which there is quite a lot) is subtitled. The animation itself is both charming and brightly coloured, even if blue-eyed Azur does look a little weird at times. The first half of the film is more successful, particularly with the introduction of comedy character Crapoux (Nigel Lambert), a beggar who agrees to help Azur. However, the quest itself is rather dull and there's no sense of tension or danger, even when the rather splendid Scarlet Lion shows up. The film's biggest problem is its script, which is perfunctory at best, to the effect that the quest plays out like a computer game (pick up magic fog potion, use magic fog potion, etc.). Similarly, it leaves several key questions annoyingly unanswered, such as Asmar's mother's unexplained transition from banished nurse to wealthy noblewoman in her own country. In short, the brightly coloured animation of Azur and Asmar: The Prince’s Tale ensures that this is never less than watchable but it could have used a bit more in the way of excitement and action.